The Battle of Mont Sorrel (Battle of Hill 62) a localized conflict between three divisions of the British Second Army and three divisions of the German Fourth Army in the Ypres Salient, near Ypres, Belgium begins today and will last until 14th June In the morning the German XIII Corps begins a massive artillery bombardment of heavy caliber shells against the Canadian positions. Nine-tenths of the Canadian forward reconnaissance battalion becomes casualties during the bombardment. Third Canadian Division commander Major-General Malcolm Smith Mercer CB and 8th Canadian Brigade commander Brigadier Victor Williams have been conducting an inspection of the front line. Shortly after Mercer has arrived in the trenches, the massive German artillery bombardment begins, heavy caliber shells destroying trenches and caving in dugouts, killing many Canadian soldiers. Mercer is trapped in a dugout and then stunned by a huge shell burst which wounds most of his staff and the officers of the battalion he is inspecting. The more badly wounded among the officers are transported to an underground field hospital but Mercer is left behind with his wounded aide Captain Lynam Gooderham, and so is not present when the hospital is buried by the explosion of four mines which preceded a large-scale German attack. In the confused situation, Mercer and Gooderham attempt to escape the advancing enemy but inadvertently run into crossfire, where Mercer’s leg is broken by a bullet. Mercer and Gooderham are both sheltered from the continued artillery bombardment in a battered trench, both suffering from the effects of their wounds, until 01:00 tomorrow. By this stage of the battle an artillery duel has begun between the armies who were still mixed together, Mercer and Gooderham trapped in between. At approximately 02:00 a shrapnel shell (possibly British) explodes in the trench in which they are hiding, further wounding Gooderham and killing Mercer instantly with shrapnel wounds to the heart. Gooderham stays with his commanding officer’s body until captured by advancing German troops who bury the general’s corpse in a shallow grave at Gooderham’s request. He remains the highest ranking Canadian officer to ever be killed in and is 57 years old at the time of his death. Williams is wounded and taken prisoner. For several critical hours both the 3rd Canadian Division and the 8th Canadian Brigade are leaderless, and their level of defense suffers accordingly. Brigadier Edward Spencer Hoare Nairne, of the Lahore Divisional Artillery eventually assumes temporary command of the Division. The Germans capture Mont Sorrel and Hill 61. Although the road to Ypres is open and undefended the Germans fail to capitalize on the success. Turks retire after three days’ fighting west of Rowanduz (east of Mosul). British forces drive the Turks out of Katiya in northern Sinai. Lieutenant Colonel George Harold Baker MP (commanding 5th Canadian Mounted Regiment) dies of wounds at age 38. He is a Canadian politician and lawyer. He was elected to the Canadian House of Commons in 1911 as a Member of the Conservative Party to represent the riding of Brome. He is the son of the Honorable George Bernard Baker MP KC (A Member of the Senate of Canada) a member of the House of Commons of Canada. He is the only sitting Member of the Canadian Parliament killed in the Great War. Major (Temporary Lieutenant Colonel) Herbert Cecil Buller DSO (Rifle Brigade, temporarily commanding Princess Patricia’s Canadian Light Infantry) is killed in action at age 34. He is the son of the late Admiral ‘Sir’ Alexander Buller GCB and he was the Aide de Campe to the Governor General and Commander in Chief Canada 1911-14. Previously he served in the South African War. Acting Captain Gordon Stanley Fife (Princess Patricia’s Canadian Light Infantry) a Rhodes Scholar is killed at age 27. He is an assistant professor of History at the University of Alberta and the Gordon Stanley Fife Memorial Prize will be awarded to the graduating student who has taken the highest average mark in two or more senior history courses. Lance Corporal Arthur Stuart Anderson (Princess Patricia’s Canadian Light Infantry) is killed by a shell at age 27. He is the son of the Reverend John Anderson. He was the Captain of the Alberta University Championship Rugby team. Killed will him is his class mate Private Robert Norman McArthur. Private Edward Cole Peters (Princess Patricia’s Canadian Light Infantry) is killed at age 26. His brother will be killed in September 1918. Major Beauchamp Henry Butler McGrath (East Lancashire Regiment) is killed at age 44. He is the son of Major General Beauchamp H W McGrath. Captain Herbert Henry Christophers (New Zealand Rifle Brigade) is killed at age 27. He is the second of four brothers who will be killed in the Great War. Captain Arthur Mapleton Hallett (Royal Field Artillery) is killed when he is shot in the head while artillery spotting. His brother in law was killed in January 1915 in the loss of the submarine C-31. Lieutenant Robert Bertram Ford (Canadian Engineers) is killed at age 31. His son will lose his life in the Second World War. Lieutenant Charles Penner Cotton (Canadian Field Artillery) is killed at age 25. He is the son of the late Major General W H Cotton and his brother will be killed in eleven days and buried in the same cemetery. Lieutenant Arthur Henry Wrixon (Suffolk Regiment) is killed at age 39. He is the son of ‘Sir’ Henry Wrixon. Sergeant Arthur Owen Philipps (Saskatchewan Regiment) is killed at age 38. His is the son of the late Reverend James J Philipps. Lance Sergeant Leonard Cecil Leicester Sutton (Canadian Mounted Rifles) is killed at age 26. He was a first class cricketer for Somerset from 1909-12. Corporal Melville Gordon Watson (Saskatchewan Regiment) is killed in action at age 22. His brother died on active service in January of this year. Private Arthur Hill (Suffolk Regiment) is killed in action at age 20. His brother will die of wounds in August of this year. Driver Melbourne Edmunds (Army Service Corps) dies at age 21. He is the first of three brothers who will lose their lives in 1916 & 1917. Private Charles Henry Ward (Gloucestershire Regiment) is killed at age 30. His brother will be killed in December. Gunner Robert Hugh Ridsdale (Canadian Field Artillery) is killed. He is the son of the Reverend Charles Joseph Ridsdale Vicar of St Peter’s Folkestone. Private Charles Douglas Baillie-Hamilton (1st Canadian Mounted Rifles) is killed at age 35. He is the son of the Reverend George James Baillie-Hamilton. 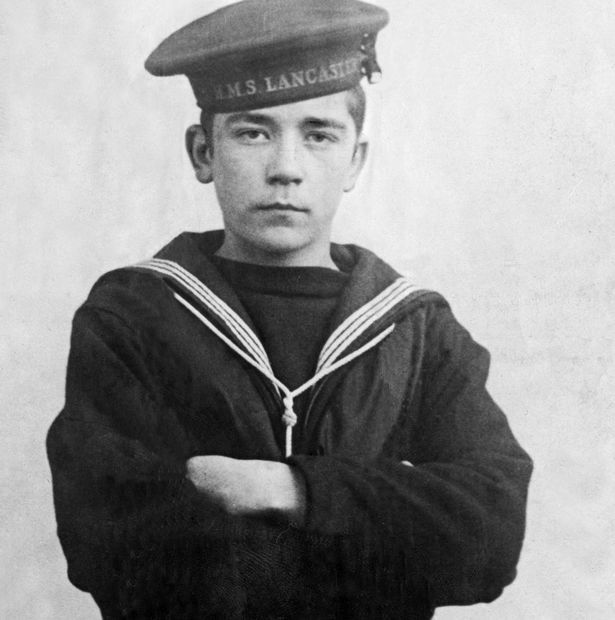 Boy 1st Class John Travers Cornwell VC (HMS Chester) dies of wounds received in the Battle of Jutland at age 16 making him the youngest Victoria Cross winner to die of his wounds and the youngest in the Great War.